Latex mattresses have a lot of great benefits for sleepers. One of the major reasons why shoppers choose latex over other types of mattresses is for its hypoallergenic properties. The Dreamfoam Bedding Ultimate Dreams Mattress is one of the best Talalay latex mattress. The mattress is a 10-inch sold exclusively on Amazon. The latex process uses Talalay latex for extra comfort and pressure relief. The cover is also made of bamboo fibers for durability and moisture absorbency. About the top: The quilted cover is made from 100% biodegradable bamboo fibers with 1.5 inches of super soft reflex foam underneath. Bamboo fiber is 4x more moisture absorbent than cotton so you can sleep with a drier and cooler sleep. Bamboo also has a hypoallergenic and and antimicrobial properties to give a more hygienic sleep. Inside the mattress: There are three layers inside the Dreamfoam Bedding Ultimate Dreams Mattress. The top layer is a reflex foam that is integrated with the bamboo cover. 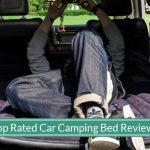 The reflex foam provides a responsive design so that if you shift around during the night, the foam will quickly bounce back, reduce sinkage, while being soft enough to relieve pressure points. The middle layer is the natural Talalay latex. Talalay latex, compared to the common Dunlop latex, has a more consistent construction for stability and is a little more bouncy and responsive to the curves of your body. The final layer is a base foam for a full body support. This high-density layer provides a firmness for comfort and keep your spine and neck properly aligned. Additional information: There are six available sizes, with five choices of “styles” (firmness level). One great feature of purchasing the Dreamfoam Bedding Ultimate Dreams Mattress is that you can select the “Customize, Ask Chuck” option and you will be contacted by Dreamfoam Bedding via email to better help them understand your needs. This mattress comes with a 10-year warranty and is made in the USA. 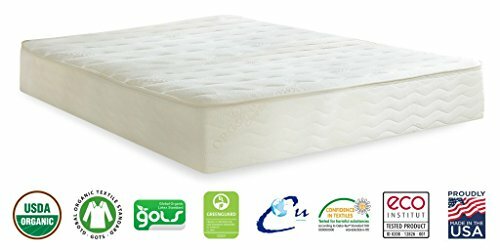 The mattress is also made with CertiPUR-US certified material. The Brooklyn Bedding Aloe Alexis Mattress is one of the best latex foam mattress. This mattress is a hypoallergenic and antimicrobial 14-inch mattress. Made with aloe vera in its ingredients, after purchase you will be contacted by Brooklyn Bedding via email to customize your comfort level on a scale of 1 to 10. The mattress also contains a layer of wool for a cooler and comfortable sleep. About the top: Aloe vera is used frequently in skin rejuvenating products. 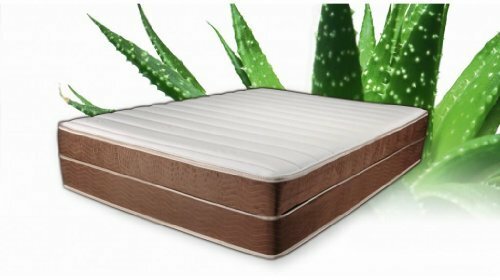 Known for its anti-bacterial and anti-fungal properties, the aloe vera treated cover provides a cooler and cleaner sleeping surface. The cover is quilted onto 1 inch of natural cotton and breathcool polyfoam. Inside the mattress: There are four layers inside the mattress. The top layer has the cover quilted onto it. This layer uses cotton and polyfoam to create 1 inch of soft, breathable top. Polyfoam, also known as polyurethane foam, is a Certi-PUR certified foam that is frequently used in many popular memory foam mattresses. Known for its low emission and low environmental impact processing, polyfoam provides the density and durability for a longer-lasting, firm mattress. The cotton also provides a natural, breathing material to allow airflow for a cool, feeling top. The second and third layers are a blend of Talalay natural latex. Talalay latex uses an open-cell design that allows for a high level of breathability and airflow to keep your mattress cool. Talalay latex is high consistent in its manufacturing and provides consistent durability across the entire layer. It is naturally hypoallergenic and anti-microbial, anti-fungal, and dust-mite resistant. This layer of talalay also gives the cushion and responsive bounciness to spring back into shape as you move around. The two layers also has air holes to further improve airflow and regulate the mattress temperature. The final layer is a high-density foam core to provide a solid, across the board full body support so your spine and neck can stay aligned without your body sinking into the mattress. Additional information: The mattress is 100% made in the USA. There is possible customization on comfort level. Upon purchasing from Amazon, you will receive an email asking questions on how to customize the feel of your Brooklyn Bedding Aloe Alexis Mattress. The Eco Terra Mattress is another one of the best natural latex mattress on the market. 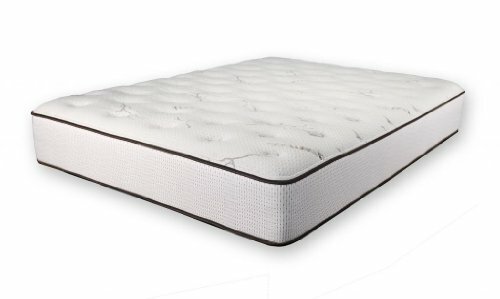 This 11-inch mattress is made with 100% natural latex and fabric-encased coils. The mattress has no fillers, no additives, and has minimal motion disturbance. It is plant-derived and 100% hypoallergenic. About the top: The cover is made with organic cotton quilted onto the natural latex foam. Cotton is a breathable material that allows for regulated temperature and provides a soft, comfortable sleep with an elegant pinstripe design. Inside the mattress: There are two layers to the mattress. The plush layer is made from 100% natural latex. This layer provides pressure relief and a buoyant sensation for its sleeper. The natural latex is hypoallergenic and has no odors or chemical off-gassing. With zero chemicals or irritants and natural antimicrobial and dust mite resistance, the plush layer provides assurance for sleepers in the long run. Each individually encased coil, along with the top plush layer, comfort through stability in support and the lift to keep your spine properly aligned without the dense pressure and feeling of the coils underneath. Inner springs are known to be more durable than foam, with less likelihood of creating uncomfortable deep sink spots. The fabric-encased coils also minimizes motion transfers so you can move with minimal disturbance to your sleeping partner. The Eco Terra Mattress also has edge support with 15-gauge coils on the edge, with 16-gauge coils in the center. The lower gauge number provides a firmer support. With edge support, sleepers can avoid sliding off the edge or sinking off when they sit up. Additional information: The Eco Terra Mattress is available in six sizes. The mattress is CertiPUR-US certified and comes with a 20-year warranty on the mattress. Coil size ranges from the smallest mattress size twin with 682 coils to the largest size California king with 1280 coils. The PlushBeds Botanical Bliss Mattress is one of the best latex foam mattress. This mattress is a hypoallergenic and antimicrobial 14-inch mattress. The top layer is made of Joma wool, one of the finest wools from New Zealand, with Talalay and apricot latex layers below for a bouncy and hypoallergenic support. About the top: The removable zipper cover is made with 100% organic cotton with the 1-inch wool layer underneath it. The cotton cover is breathable and allows for airflow for regulating surface temperature, is soft and plush, and knitted. Inside the mattress: The PlushBeds Botanical Bliss Mattress has four layers of foam. The top layer has the cotton cover quilted on. This layer is made with 100% Joma wool. Joma wool is one of the finest wool from New Zealand. This wool is crimped 100% and gives a bounce and soft support characteristics. The core of the fiber is resilient, providing a durable layer that allows airflow to keep the surface of your mattress cool and fresh for a good night’s sleep. The second layer is Talalay latex which provides a consistently supportive layer that offers bounce back so your body remains properly aligned during the night as you move around. Talalay is hypoallergenic and antimicrobial naturally and is dust mite resistant. The final layer is made with a natural product from the sap of rubber trees. With 6 inches of support, sleepers get a real solid back support and can sleep on a firm and comfortable mattress during the night. 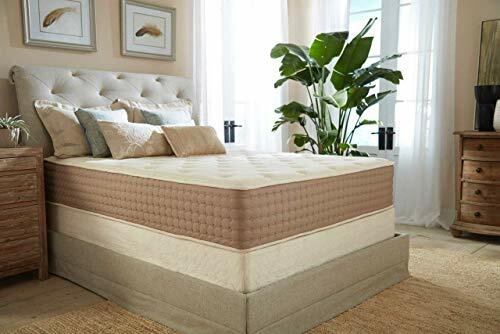 Additional information: The PlushBeds Botanical Bliss Mattress is made to meet global organic latex standards (GOLS) and the latex is USDA organic certified. It is available in nine sizes on Amazon, with three of the nine being split options of two-person sizes. You can also pick between two available sizes (medium and medium-firm), although description suggests there are four different firmness options available. There is a 100-night trial with free returns and no shipping or restocking fees. The warranty is 25 years. 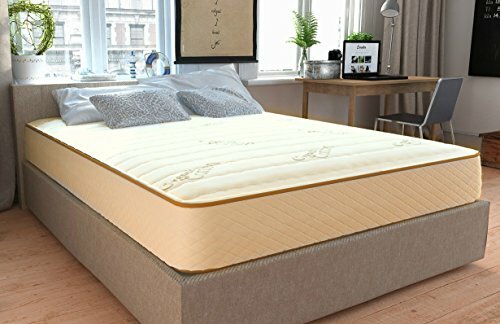 The Sleep EZ Roma Mattress is a 9-inch Dunlop latex and foam mattress with the Dunlop latex sandwiched between two layers of cotton-rayon polyfoam. The mattress is built to be hygienic and comfort in mind, with the ability for owners to flip the mattress as needed. The cover is also a blend of cotton and polyester for breathability and durability. About the top: The cover is made of 60% cotton and 40% polyester quilted to the 1.5 inches of polyfoam on both sides. The cotton-polyester mix provides the best of both worlds with high breathability for a fresh top and durability and longevity with polyester. Although the cover is not removable, you can count on it to last longer than most removable mattress covers. Inside the mattress: There are three layers to the Sleep EZ Roma Mattress. The two 1.5-inch polyfoam layers wrap both sides of the Dunlop latex. This layer is made of organic cotton and rayon mixed with polyurethane foam. Cotton is known for its breathability and regulating temperature and rayon is a synthetically made fiber with moisture absorbent, antimicrobial properties, and breathability. Wrapping a center of Dunlop latex, this makes owners able to flip their mattress and use on either side. The 100% natural Dunlop latex layer provides durability and hygiene as Dunlop is hypoallergenic, highly durable, and mold, mildew, and dust-mite resistant. The durability and firmness of Dunlop provide a great full body support during a restful night to maintain proper alignment so you don’t wake up feeling muscle pain. Additional information: This mattress is CertiPUR-US certified and made in the USA. The mattress also comes with a 20-year warranty. Latex mattresses are a natural material that is hypoallergenic and without chemicals and irritants. They are durable in elasticity so you can sleep comfortably as they can bounce back to shape. They are also firm in feel which is in the suitable range for most sleepers. If you are in love with latex mattresses, be sure to check out latex pillows as well. When deciding on a best latex mattress for you, keep in mind the special touches to mattresses that can help you sleep better in the long run. Aloe vera, bamboo fiber, and cotton are excellent ingredients to covers to provide high breathability and airflow so the surface of your mattress can stay cool overnight. 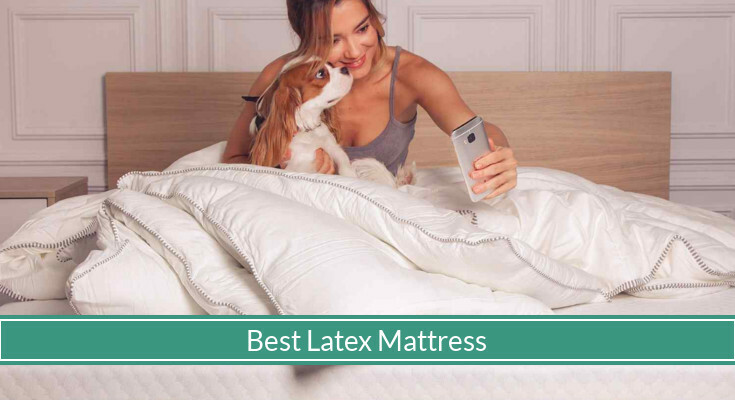 We hope this guide is a strong starting point for further research and we wish you the best to find the best mattresses using latex.